Disclaimer: If I do something stupid, don't worry: it's just me. --¿Vulpa? I'm atypical in that I loved the last few years at my Central New York high school, but I've got to say the college experience as an Electrical Engineer (focus on nanotechnology) at the University of Texas at Austin is pretty awesome. Hobbies include anything that isn't productive (generally binging sitcoms or snack food), as well as voraciously reading or spending long hours playing video games. I'm technically bilingual after over five years of Spanish but that doesn't mean I don't still rely on Google Translate a little. I enjoy drawing (charcoal or colored pencil as the preferred mediums) and photography (not all that hard developing stuff though), and for various reasons over the years I've become at least rudimentary in piano, guitar, clarinet, and harmonica. I was recently asked if I like humans or animals better: I still don't know the answer. Both have their merits: stimulating conversations and adorable fluffiness. Either way my roundabout point here is that I love being in nature: hiking is ok but honestly I like to just sit in it. With a book or camera or sketchpad or guitar, apparently. This user scored 10415 points on the UESPholic Test. Este usuário tem um total de 1 815 edições desde que entrou na UESPWiki. Este usuário está na UESPWiki há 13 anos, 3 meses, e 19 dias. Surfing the wiki for small edits to make, working on the OBNPCRP, and general loitering. Hopefully I can do images now that I have a PC! I am also always searching for the elusive red exclamation marks (yes, you can laugh, full-Patrollers :P ). Note: use these links! I picked up Oblivion as our first XBox 360 game. I devoted several characters and many, many, many hours to it (er... maybe over 6000 maybe not) until I had achieved 100% completion and had a memory already for every cave I would encounter, at which point it began getting old. So I got Morrowind as well, but found that I had spoiled myself on Oblivion's superior graphics and leveling (being killed by the first mudcrab I met didn't help either). Then I found the Shivering Isles, and developed my inner mania (a lot... I basically worked that DLC to death) until Skyrim came out. I finally got both a PC and ESO so now I'm very excited to be onto that and help out with the large amount of work to do here. Anyway, this site just feels like home after all that time spent, and I'm glad to have met such great people here. 45x45px This user writes fanfiction. Female Dunmer DragonKnight fighting for the Ebonheart Pact. She's pretty undeveloped right now (hence not having a userbox for this segment) but a hardy explorer and huge proponent of pyromania. Female Argonian Battlemage -- Ebony sword in one hand, firebolt in the other. Female Khajiit Master Archer -- she's used absolutely no other weapon since her creation! Long-time Listener of the Dark Brotherhood and Nightingale of the Thieves' Guild. A complete Maniac! Resident of Highcross. Dark-haired Bosmer, archer until an enemy is too close--then they get a fireball to the face. Driven completely maniacal from an extended stay in the Shivering Isles. Has now forgotten the way back to Cyrodiil, and is permanently stuck with her madness and role as Madgod. 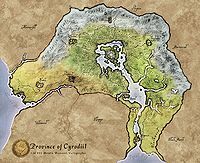 Twin of the same name was abandoned in Cyrodiil. 45x45px This user is a Gray Fox in the Thieves Guild. Originally an odd sort of thief -- favored Destructive snipings, and longsword getaways. 99.9% game completion!!! 45x45px This user is an Arch-Mage in the Mages Guild. Separate playthroughs, but went between them often enough that they must be related. Both mages whose names I've forgotten. Was a fan of Modryn Oreyn. 45x45px This user is a Listener in the Dark Brotherhood. Female whom I went through all of an hour with before dropping Morrowind and not picking it up again, to this day (couldn't stand starting out so darn WEAK). She was going to be a war-axe wielding warrior, so would have been one of the stronger ones in the Morag Tong. 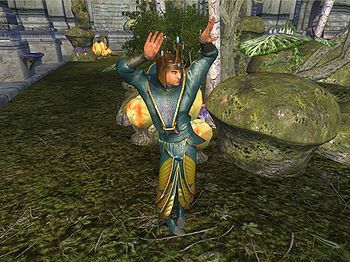 Thadon practicing his dance routine in the Halcyon Conservatory. "So I put my hands up, they're playin' my song..."
"I put my hands up in the air sometimes, saying AYO...."
¿Vulpa? | ¿Vulpa? | ¿Vulpa? Esta página foi modificada pela última vez à(s) 00h08min de 14 de março de 2016.